As I approached the fifth chapter of the book of Amos I noticed some difficult text. This got me thinking about the two main types of delivering the Word of God. One of the types would allow us to easily avoid the difficult passages. As you read take note of the multiple times I use the word “preaching” in this article. Although preaching from the pulpit is certainly a part of it, what I mean to address is more inclusive. 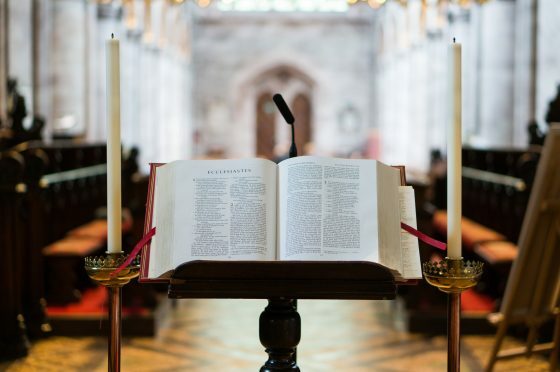 In this article, when I say “preaching”, in my thinking I am including Bible studies, devotional articles, books, one on one conversations, or any time the word of God is elucidated. We seem to encounter two main forms of preaching in the modern world today. The first and by far the most popular is topical preaching. The style is well named in that it communicates clearly how it is done, which of course is by topic. Most often the orator simply pics a topic, then goes on a hunt to find Bible verses that will support or prove each point he wishes to make during his presentation. This is a very dangerous approach to the study and delivery of God’s word. Expectedly, topical study/preaching lends itself well to pulling verses, or worse yet, verse fragments out of context. They can then be manipulated and made to mean what the communicator wants them to mean with little regard for the original, intended meaning. Topical communicators are under constant pressure to come up with material that is interesting, culturally relevant, and encouraging. One potential benefit of topical preaching is it is easy to avoid difficult or controversial passages in the Bible. Most modern day topical sermons and studies do not require you to think, they just make you feel good. To be fair there is a right way to do topical preaching. It can be a very useful method of communicating God’s Holy Word to man. However, most topical preachers have no interest in doing it properly. What I have described is the wrong way, and unfortunately the most popular way, to do topical preaching. Most if not all megachurches are on built on this bad form of topical preaching. Topically communicating God’s word like this most often is a gross misrepresentation of God and His Holy Word. Topical preaching (as I’ve described it) tends to be anthropocentric as opposed to theocentric. Anthropocentric simple means “man centered”, and theocentric simply means God centered. You will never hear a topical preacher declaring “context, context, context” as his Bible study and preaching montra. He makes no attempt to keep his verse references in their textual context. The verses he has selected have been ripped out of their place in the Bible and pasted into his topical outline. Because the topical preacher is attempting to keep his message relevant to a modern audience he doesn’t care about historical context. He finds the risk that considering historical context may skew the point he is attempting to make, wholly unacceptable and reason enough to avoid it. The topical preacher’s proof text must mean what he wants it to mean. Additionally, the cultural context in which the biblical passage was written has no bearing on his use of the text. The communicator wants to keep his message applicable to the culture of his audience. Do you think you would ever hear a topical communicator say, “Amos 5:1 Hear this word which I take up against you, a lamentation, O house of Israel:”, now that’ll preach! The second main form of preaching we encounter is expository preaching. It is by far the least popular form of preaching. As a matter of fact, most professing christians in the western world could not define this method, because they have not experienced it. I would argue that expository preaching is by far the superior method. In the expository method the preacher selects a passage of scripture, taking care to select a logical chunk in order to keep it in its textual context, and applies a consistent method of study in order to discover or expose the author’s meaning. The skeletal structure of his method includes the ordered steps observation, interpretation, correlation, and application. A good expositor approaches the Word of God knowing that authorial intent (what the author intends to communicate) trump’s reader response (what the reader thinks it means). The observation phase of study is the most important. A good student of God’s Word will bombard the text with questions. The “W” questions are a good place to start. Who is speaking? Who is the author communicating to (original audience)? Where are they? What is being discussed or described? Why was this written? How were the things talked about done? When was the passage written? When did the events described occur? Ask the question, in what Historical context did the passage occur? Is it connected to other biblical or secular historical events? Cultural context asks what cultural influences may affect how we understand the passage? Textual context asks how does this passage I am studying fit with the verses or chapters above and below? Looking up important words in a source language (Hebrew Old Testament, Greek New Testament) lexicon is an important step in the observation stage of study. Only after we have “observed” all there is to see in the passage we are studying are we ready to “interpret” it. Interpretation is not me deciding what I think the text means. Interpretation should only happen after assembling all of the facts collected in the observation stage and considering them. Interpretation simply answers the question, “what meaning rises to the surface when I consider the the facts I’ve uncovered”? My understanding of the correlation step in the process is it is comparing scripture with scripture. Once again the concept of “context, context, context” is in play here. Contrary to what the skeptic claims, there are no contradictions in the Bible. If when you’ve interpreted your passage it conflicts with another portion of scripture, your work is not done. Compare scriptures, do more observations, dig some more, then adjust the interpretation. You’re interpretation of the studied passage should correlate nicely with the rest of the Bible. The one and only Holy God of all creation, the redeemer of mankind, Yahweh by name, has chosen to communicate His message to us in written form. Dare we change what God intends to say into what we want to hear? Dare we preach popular cultural messages, instead of delivering God’s Word? Beware of the preacher who does not fear God, nor reverence His Holy Word. It is critically important that if we are going to represent God and His Word, me must do so humbly, reverently, and accurately. 2 Replies to "Amos - Chapter 5 Introduction"
This was explained so well. Thank you. I have tried to talk to my sister, and several friends about what TFL is doing and their comments make me so sad. My sister says their motto for their church is Live Laugh Love. And they get little sermonets. They are quite happy. My friend says her pastor makes her feel happy. In fact they have taken all the Bible’s and put them on a shelf in another room. Thank you for your clear teaching of the Scriptures. I have been so Blessed by TFL. My husband would have loved this church. Well said Sharon. Great teaching Mark!